In the last ten years, Ruben Sanca has become synonymous with UMass Lowell not only for working there since attending undergraduate school but also in his exemplification of the traits that the university holds close. Sanca, an Olympian marathon runner who is currently training for the 2020 Olympics, considers himself a full-time staff member at UMass Lowell first, and a runner second. His love for the school runs deep, in part because it has given him so much. After all, he liked the school so much that he graduated from it twice. Sanca says that he derives more value from the people he has met and the overarching lessons he has learned than from strictly the classroom component. He admires the student body, and sees himself reflected in the myriad students who cycle through and get their degrees after years of hard work. Sanca brings up that several of the students at the university are first-generation college students, often immigrants or the children of immigrants. Much like himself. “They are the hardworking blue collar type of student and I think that’s what I really carry with me,” Sanca said. His admiration for the student body, as well as the rewarding aspect of his work, entices him to stay at UMass Lowell — even after so many years. To leave now would almost be akin to leaving home. Sanca has always been involved with UMass Lowell in some capacity, even while he took undergraduate courses. As an undergrad student, Sanca took initiative and joined the Student Government Association, the Student Athlete Advisory Committee and worked in various offices around campus. After he graduated, Sanca continued to serve the school in administrative affairs. It is difficult to find an office on campus that has not been affected by Sanca’s work in one way; it speaks to not only his reach but his matchless commitment to his alma mater. “I worked in Athletics, I worked in Student Affairs, I worked over even at M2D2 when it first started,” said Sanca. The university has given him not only extended opportunities to develop as a person and as a professional, but it has given him a lot of room in training for marathons. Sanca says that in return for UMass Lowell’s understanding, he ranks his work for them at the top of his list. “I’ll do a lot of travel and the school has been very supportive of that,” Sanca said. He does his best to schedule marathons with the personal and vacation days that he is given, and tailors his training schedule around his job in the Office of Student Affairs. While the full-time runners he competes against in marathons have the full day to schedule their training runs, Sanca has to brave the slush and cold that comes with wintery mornings and evenings. While it is not easy for him to train in this way, he accepts this as a reality in pursuing his ultimate goal: another chance at the Olympics. Sanca previously competed for Cape Verde in the 2012 Olympics, but had to deal with a tumor on his leg during the whole ordeal. Now six years older and without his uninvited friend, Sanca hopes that he can do even better at the 2020 Summer Olympic Games in Tokyo. He says that he will find out the standard qualifying time in November, as most of the students he mentors will feel the impending pressure of finals. While they may feel panic, Sanca feels a calm brought about by many years of balancing his two passions: running and his work. “My next race will be in Dubai, on Jan. 25, 2019, so on that weekend I can probably know whether I will be in Tokyo or not,” Sanca said. He is hardly bothered by how close to now that is. The training has been going well, too. Sanca says that at the Berlin Marathon he was on pace to break the national record for the marathon until the last four or five miles of the race. While he was unable to achieve that particular goal, it was a strong indicator for Sanca that Tokyo is well within his grasp. Sanca tends to take a positive outlook on life and on running. 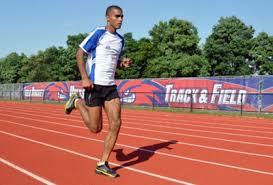 Working at UMass Lowell, with the support it has given one of its favorite sons, has helped Sanca keep at training. That support he receives is given back a hundredfold through his own service to the school. He intends to continue serving it for the foreseeable future, in gratitude for all it has given him. Even despite all of his achievements, Sanca does not consider himself one of those success stories. He says that he views himself merely as someone who was able to accomplish a lot thanks to a strong support system. “I’m really thankful to be here and one of my goals is to make it to Tokyo, not just for myself but for my family and all of the people who have supported me here,” he said.